This year, I ditched my “tax guy” and told my wife, “I’m smart enough to do this on my own.” Questionable assertion? No doubt. But she appreciates my conviction—and the prospect of saving a few hundred dollars. In an effort to avoid the big 3—TaxAct, H&R Block, and TurboTax—I poked around Google for a bit, thinking that there must be a cool tech startup doing the tax thing. (Can we say, “ripe for disruption?”) Nothing. 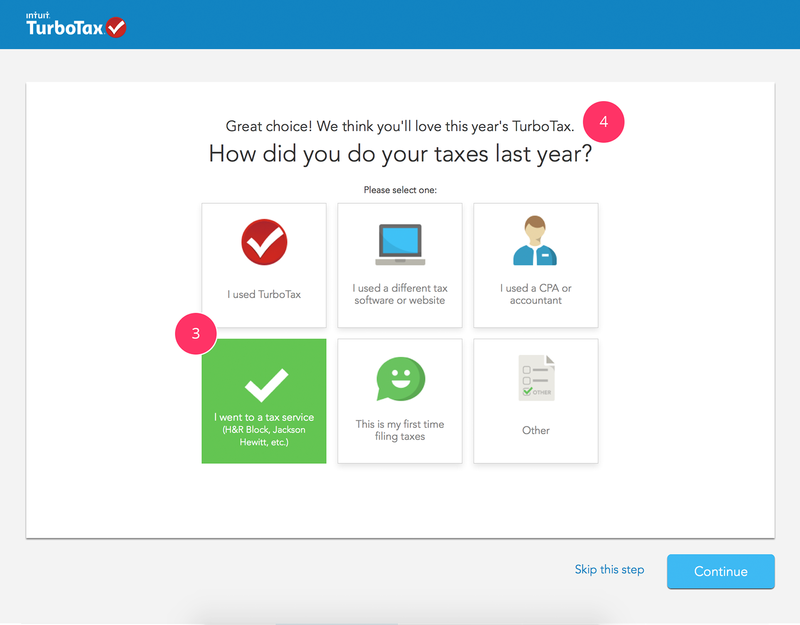 So I peeked at the 3 options and decided TurboTax must offer the best UX, based on their landing page. Thankfully, that totally naive assumption panned out. So I thought I’d share my experience with you—in hopes the world may know a better online tax experience next year (or this one, if you’re running late). Here it is. 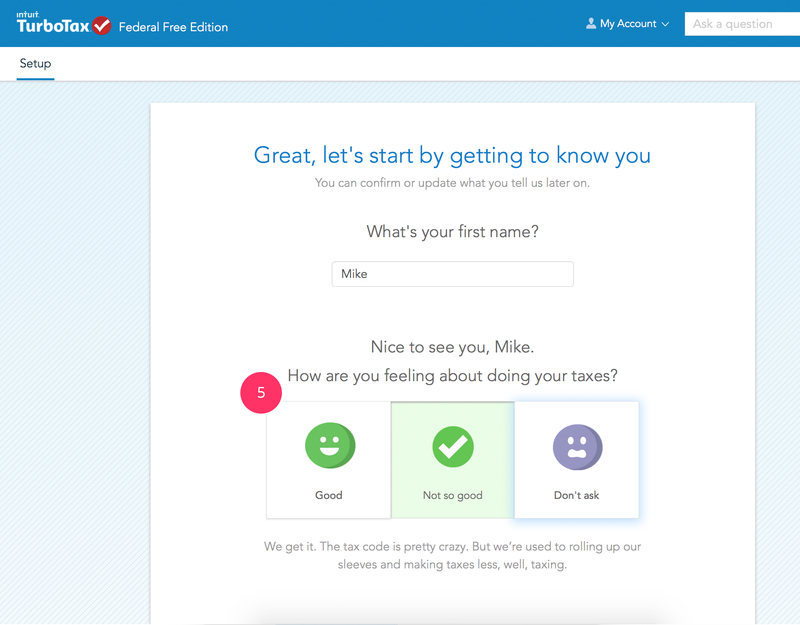 Charming, devilishly good looking, and just as silver-tongued: the TurboTax user experience. Note that I used sample data to avoid embarrassing myself. And your jokes about Al Capone, white collar crime, and IRS auditors. Landing on TurboTax’s main marketing site, I jumped right into a registration process—that didn’t feel at all like a registration process. Instead, I felt like I was already working on my taxes. They started figuring me out right away. And where I expected ugly drop-downs leading to more screens and text boxes, they gave me fun interactive icons using a clear—and clearly branded—visual language. I started fiddling around, clicking lots of buttons, and the interface updated with every variation, suggesting a different product for each scenario. Interestingly, despite the differences in products, each featured the same “Start for Free” CTA. We’ll have to see if that turns out to be disingenuous later. After all, names like “Deluxe” and “Premium” suggest these services come at, well, a premium. 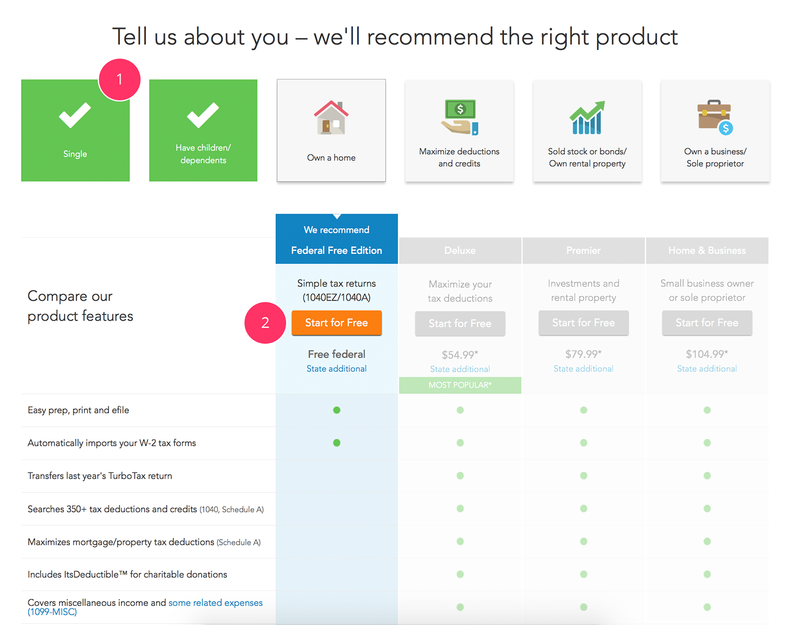 But overall, TurboTax did a great job delivering on the header copy’s promise of “recommend[ing] the right product”. UX pro tip: Try-before-you can really optimize conversion in situations where users have to share a ton of info. After all, who wants to start over? Once I selected my product, all my previous decisions became part of a profile I didn’t even know I was creating! Just as the serious questions started rolling in, they asked me to pick a username and password. And not a single obnoxious dropdown menu could be found. This is where TurboTax gets witty. They ask a series of questions to gather marketing data and prepare the right user experience for you. The smart part is, every question feels absolutely relevant, so I don’t feel like I’m being gamed. Think ‘choose your own adventure.’ For taxes. The last time I did my own taxes, Facebook didn’t exist, and I was rocking Smashing Pumpkins on a Sony Discman. So all this could’ve felt a bit overwhelming—but the personal and interactive copy inspired me. It told me I was making good choices. It told me I could tackle this terrible task. It kept the tone light and fun. Hell, it did everything but purr in my ear that it’d all be okay. UX pro tip: See the “Skip this step” link? That’s for people who know what they’re doing. I never even considered it, because all I had to do in this experience was click boxes that lit up and said nice things to me. The tax code is pretty crazy, TurboTax! It’s like you totally get me! 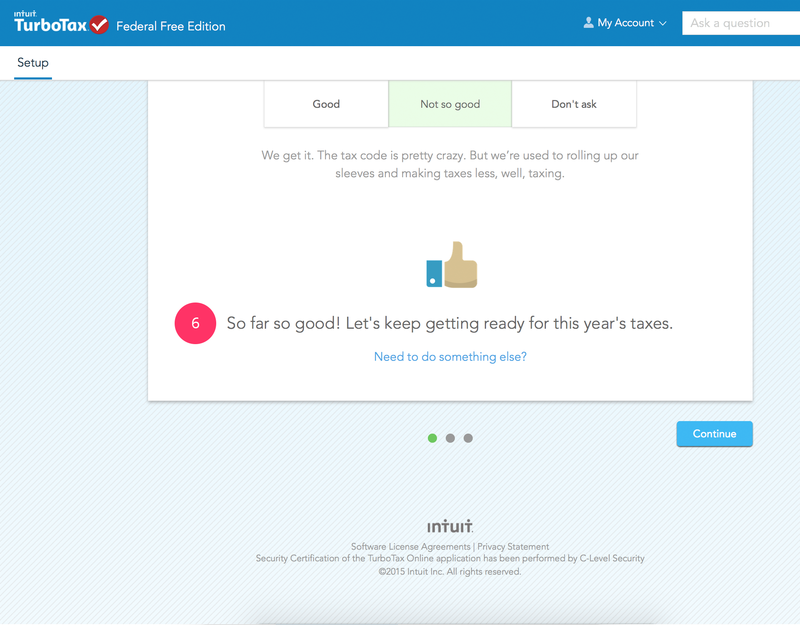 After a quick, cool loading screen dominated the famous TurboTax checkbox, I’ve logged in. Here I’m again met with the well-established visual language combining icons, text, and highlighted interaction areas. It feels like a touchscreen experience on a desktop—very smooth. By now TurboTax has gathered that I’m married, filing jointly, and have kids. They keep asking questions that both gauge my feelings and help them prepare the right type of filing. Amazingly, they still don’t have my name yet. When will they ask? There it is. After filling out my name, I’m met with a question I didn’t expect—and another opportunity for personalized interaction. How are you feeling about doing your taxes? No one’s ever asked me that before! My response was met with a well-written block of copy that says exactly what I needed to hear: “The tax code is crazy.” Reassurance is priceless. Now I’ve made it through the first setup screen and gotten a little more moral support, helping me finalize the setup process. I’m actually starting to get a bit of a kick out of this. From a conversion perspective—and when I say conversion, I mean “making the product sticky for me”—there’s no better way to do this than by making the information-gathering process fast and fun. The deeper I get into the weeds, the more likely I’ll pay the premium price to file, even if I have other options. UX pro tip: Here, TurboTax asks, “Need to do something else?” That provides another alternative for those who don’t want to “choose their own adventure.” I appreciate that, and I think people who’ve used TurboTax before do too. On to page 2 of setup: time for detailed questions about my working status, donations, and pretty much every other scenario possible. When you select these boxes, they become part of your workflow for your filing. Interestingly, I had to make a few accounts to test these boxes, because once you leave this page, you’re off and running on your filing. 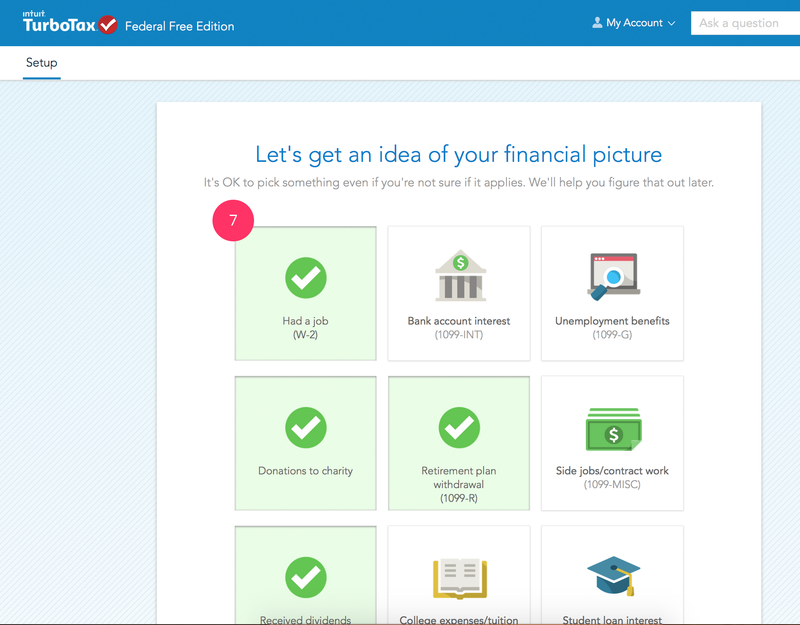 UX pro tip: TurboTax’s assurance that there are no wrong answers here is particularly powerful, because one of my main concerns was picking the wrong boxes. Subsequent screens step me through my first W-2 and through each additional box. At this point, I took a quick break to pick up the kids—and returned to see that TurboTax had logged me out, but saved my progress. Security and reassurance FTW! I logged back in and was greeted by a clear call-to-action to “Pick up where I left off.” Considering that I have no idea where I was in the process, this button is a fantastic touch. UX pro tip: Find inspiration everywhere: this reassurance feels like it comes straight out of the gaming world, where it’s always vital to know if you’ll have to replay that last level. The goal of filing your taxes is to assess the damage—or walk away with a return on your temporary investment in the government. This sidebar widget keeps that primary goal front and center (or maybe up and to the left) throughout the experience, and responds to my input. Similarly, this countdown timer creates an awesome sense of urgency. Search anything and it leads you back to the relevant deduction or section of your filing. Need to add a home-office deduction? 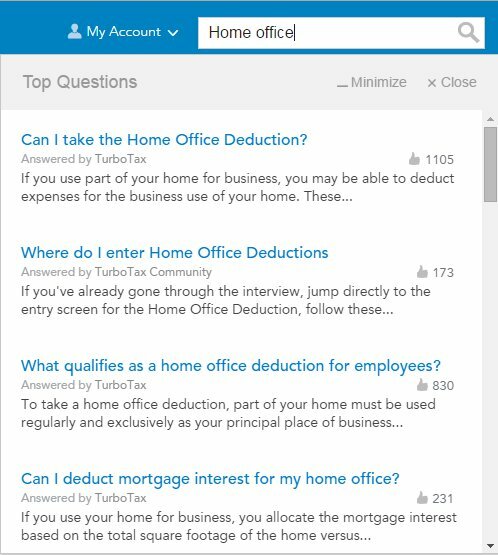 TurboTax provides some quick clarification and links you right to the working area in your filing. And all the content’s crafted in plain English. Genius. Here are 6 key things any UX professional can learn from this beautifully crafted experience. A consistent and highly visual UI combining icons and text offers a much better experience than a thousand drop-downs, checkboxes, and text inputs. Consistent, friendly, and action-oriented copy keeps things fun and interactive. Bookmarking progress builds trust and speeds things up. Keeping the goal (carrot) and deadline (stick) front and center can help prevent drop-off and make it clear that the product is focused on the user’s concerns. Create a sense of urgency when users return to the product. Make support content clear and direct—and make sure it points me to where I can take care of business. Notice how the sidebar widget was there even 10 years ago? Some ideas are too good to let go. 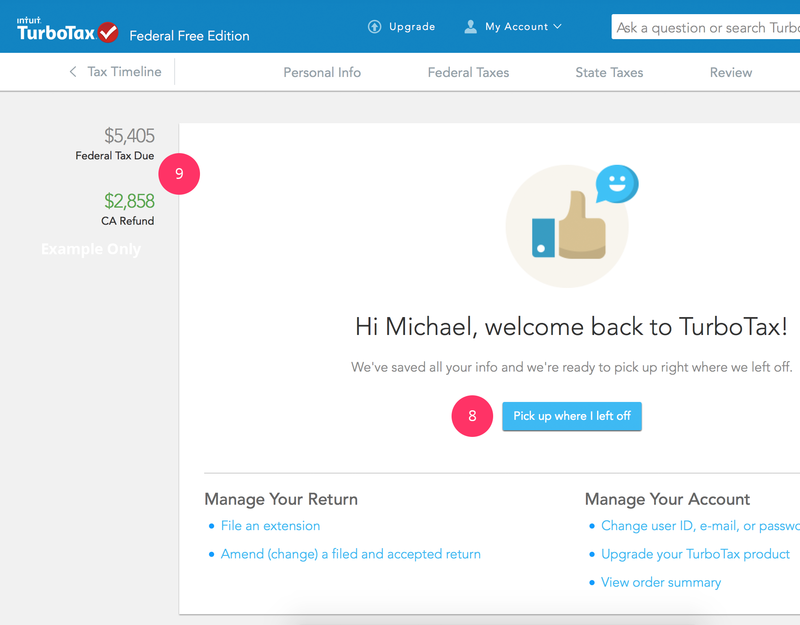 I refuse to say “I enjoyed doing my taxes this year.” But TurboTax’s UX kept me engaged, entertained, and on task, so I filed on time—which hasn’t happened since AOL was a thing.